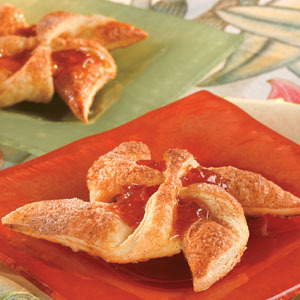 These simply sweet dessert treats combines flaky puff pastry with warm apricot preserves and a dusting of cinnamon sugar...served warm, dessert doesn't get much better. Heat the oven to 350°F. Stir the cinnamon and sugar in a small bowl. Unfold 1 pastry sheet on a lightly floured surface. Roll the pastry sheet into a 16x8-inch rectangle. Cut into 8 (4-inch) squares. Repeat with the remaining pastry sheet. 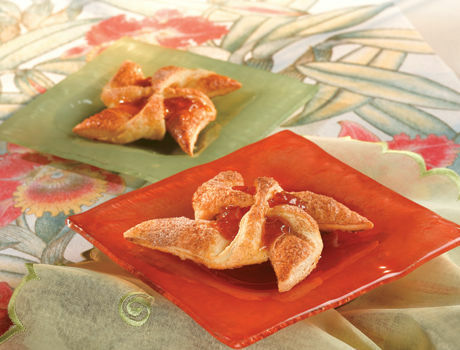 Spoon 1 tablespoon apricot preserves in the center of each pastry square. Using a sharp knife, cut diagonal lines from the corners of the pastry to within 3/4-inch of the preserves. Fold every other corner up over the preserves to the center, overlapping the points and pinching to seal. Place the pastries onto a baking sheet. Sprinkle with the cinnamon mixture. Bake for 20 minutes or until the pastries are golden brown. Remove the pastries from the the baking sheet and let cool on a wire rack for 10 minutes.